For weeks, pop, country and R&B had been switching foot to dominate the Billboard Hot 100 chart. Rap was not within sight until T-Pain's "Buy U a Drank (Shawty Snappin')" successfully landed the very first spot. The song first peeked at #84 and stayed in the chart for seven remarkable weeks by climbing at a steady rate until it reached the highest spot. Though having a slow hike, the single that is featuring Young Joc, has been the greatest airplay gainer for seven times. So unconventional does the song that it also receives various remixes from his fellow warriors such as T.I., R. Kelly, Stat Quo, Pitbull, P. Diddy, Kanye West and many more. This single proves two things about him; that he actually can pen a number 1 hit and that he hasn't lost his niche since "I'm N Luv (Wit a Stripper)". With the single's strength, his album "Epiphany" might encounter the same fate upon its release in June 2007. This is probably why he is made one of the musicians trusted to bring back the career of pop queen Britney Spears. Determination proves to be working out great in T-Pain's life. Born as a middle child of five in 1985, Faheem Najm learnt a lot from his Entrepreneur father who was doing a lot of music himself. His dad often took him to the studio whereby he watched and learnt carefully until he could establish his own 'mini' studio. At age 10, his bedroom was converted into a small mixing pot, which at that time already facilitating a keyboard, a beat machine and a four-track recorder. Using the minimal equipments, little T-Pain would compose tunes, trying out beats and eventually piled a huge collection of songs. And then he started the singing. However, seeing that everybody around him did rapping, he began to pursue the same thing and actually was avid at it. He said, "The rapping was just something that I started doing cause I thought it was cool." This routine continued until he landed a role in a five-piece rapping outfit called "Nappy Headz". The group had a good start in 2000 through the songs "Robbery" and "F.L.A." but soon the flame died and he started thinking about getting the spotlight alone. As soon as setting his mind on solo career, he was back to his songs collection and started his own production company called Hard & B, just for a personal entertainment. Little did he knew that his friend was impressed by his skill and sent his song "Time to Make Love" to The Beat radio station personality Felisha Foxx. The song quickly stole Foxx's heart and was played on the radio several times in one night. It soon became a regular in the radio playlist. 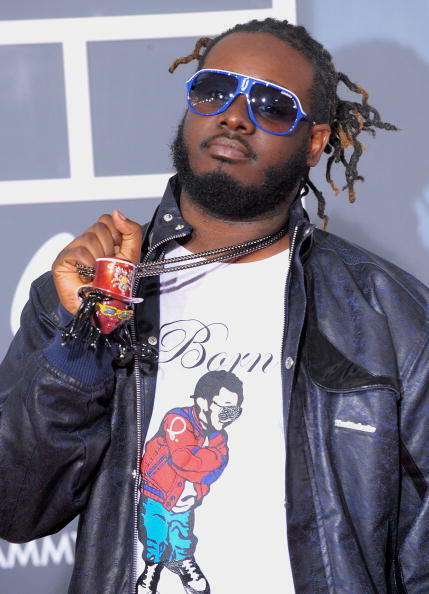 After that T-Pain began working on "Fucked Up", a remix of Akon's "Locked Up" which was often praised as a better version to that of Akon's. Hearing about this, instead of igniting a rivalry Akon signed him under Konvict Music when he saw a huge potential waiting to be shaped. This was the time when he was known as his stage name T-Pain, an abbreviation of Tallahassee Pain in reference to his birth town, Tallahassee-Fl. A record dubbed "Rappa Ternt Sanga" soon came out in November 2005 after his single "I'm Sprung" gained success three months earlier. "I'm Sprung" was hugely popular in US that it peaked at #8 in Billboard Hot 100. The song was written based on his love experience with a girl whom he married later on. This personal and compassionate style eventually became his signature. In another track "Fly Away" he described his relationship with his father. It was not until second single "I'm N Luv (Wit a Stripper)" that he gained a larger fan base mainly because of its bolder content. By then, T-Pain was marked as one of few artists to employ the Crunk & B styling, making him a very unique musician at a considerably young age. He was also known for his stage persona whereby he not only sings, but also dances. Other musicians such as J-Shin, Jay-Z, Shawnna and E 40 suddenly wanted to work with him. He was doing a lot of songs with them while still concentrating on solo career. Another album "Epiphany" which came out June 5, 2007 kept his spirit true. "I think it's the idea that my music is true, and I'm not afraid to try different things. Just that it comes from my mind." And thus the album soared to #1 in Billboard Hot 200 chart the first week of its release, beating Rihanna's highly anticipated album and Paul McCartney's first studio album in two years.